← Holidays in France: More than Fishing ! As the weather was cold and the skies clear I decided to opt for zig rigs, having recently acquired a set of Nash zig floats. I had had a good drop back the week before on a zig, but failed to make contact. I therefore figured under conditions it was my best option. Well the first 24h passed without so much as a bleep. I must say I was a bit disappointed. One rod was therefore switched over to a snowman and placed on a marginal point, where I often manage to get a fish. This change of tactics paid off and I had my first carp of 2015 in the shape of a 23lb mirror. The run came at 3 am and my rod was completely covered in frost. The night had been a very bright full moon, with not a cloud in the sky, in fact when I weighed the fish the moon was brighter than my Petzl. On reflerection, perhaps I had missed other chances by opting for zigs.. but they seemed a good bet, and you have to be in to win!! 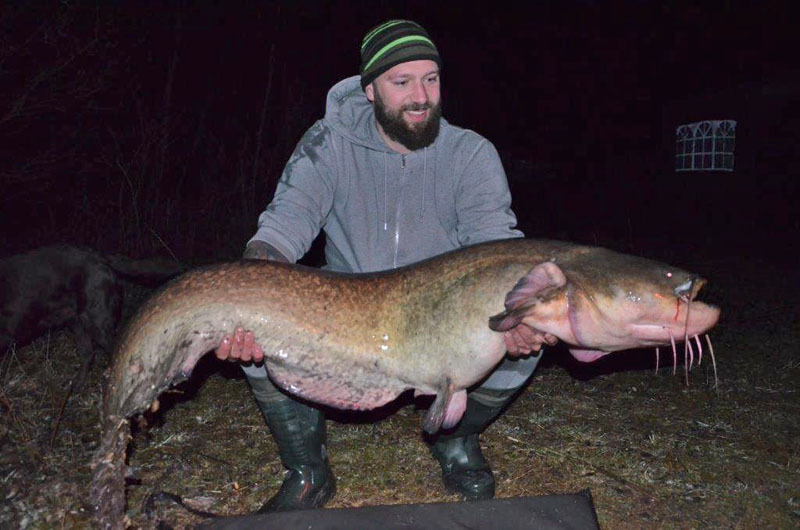 Meanwhile Franck Lassalle on the mobile home swim managed the first catfish of the year at 41lb. 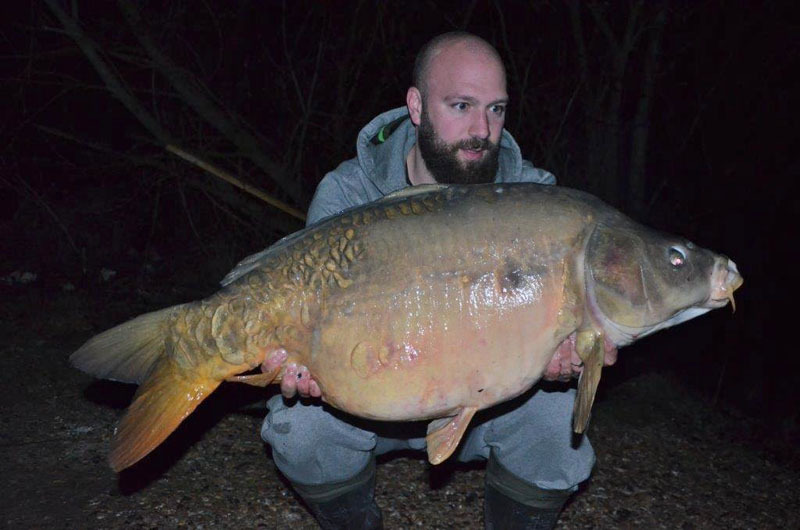 The next week venue regulars Christophe Aelterman and his mate Davy Elegeer were on the Tortue. 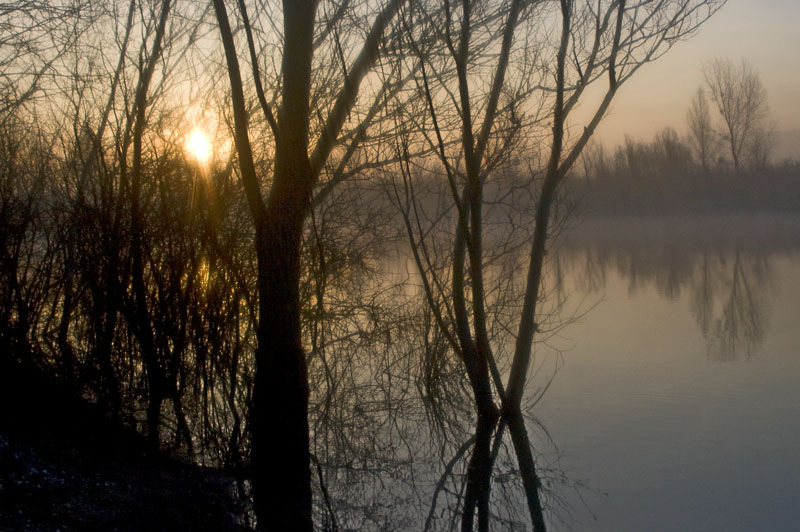 Conditions were better than for myself and they very quickly managed to bank a few nice carp. He set up on peg 13 and in the four nights he managed sicx runs for five fish with one loss; they went 35lb 4oz; 30lb; 33lb 9oz; 21lb and a super 47lb common. Meantime on the peg next door (14) David also had some action with five runs for 4 fish banked two mirrors and two commons to 36lb. The verdict 41lb 2oz. My first forty of 2015…. With only one angler on the Tortue Lake I decided to have another go for the weekend. During the main season I don’t get to fish the lakes very much, one of the downsides to selling out the pegs.. LOL!! I set up in peg 12, as the water was now once again low enough to allow this. As per my session a fortnight earlier it was cold and frosty at night. I set up and fished my usually productive spots on this peg. I spombed out about 10 cast of hemp and sweet corn and a few broken Rahja Spice boilies. The right hand rod was the usual snowman, the other two were on method feeders, one with fake corn, popped up and the other with two 12mm fluoro pop ups. Within an hour the double pop up rod sounded and I was into fish. Unfortunately about half way in the hook pulled. All rods were recast and I sat back to await events. All was quiet till dark so as the cold was closing in I went to bed. I had a run on the snowman rod at around 1am and right away knew it was a good fish. It came in quite easily to the margin and then woke up and fought doggedly in the deep water. My head lamp wasn’t helping but it was so dark, I needed it to keep the fish away from the marginal snags. Anyway I got it in the net and right away knew it would go over 40lb. The verdict 41lb 2oz. My first forty of 2015…. I was very pleased. The second night the north wind got up and the day and night were bitterly cold, with a frost down to -4°C. This killed the fishing for the remainder of my stay. 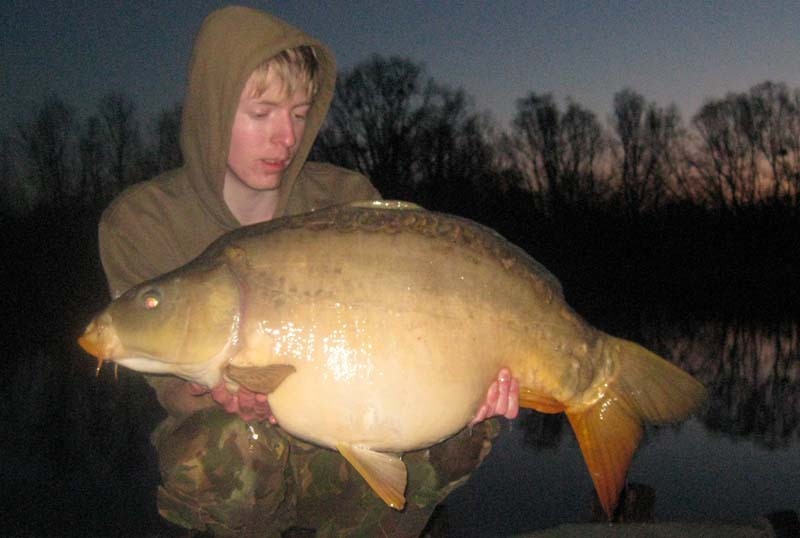 The Dutch angler opposite also managed a couple of carp during his stay in the 25lb to 26lb bracket. Dutch anglers Harry & Bram Van Leuwen arrived with a group of 6 anglers for the week. Again regulars to the venue, the aim was to go for the cats and remove any small fish. This however did not work out too well as they only managed the bigger cats and a few nice carp too. The best mirror from peg 13 went 45lb. The best catfish tipped the balance at just under 60lb. The total of 7 catfish between 34lb and nearly 60lb. 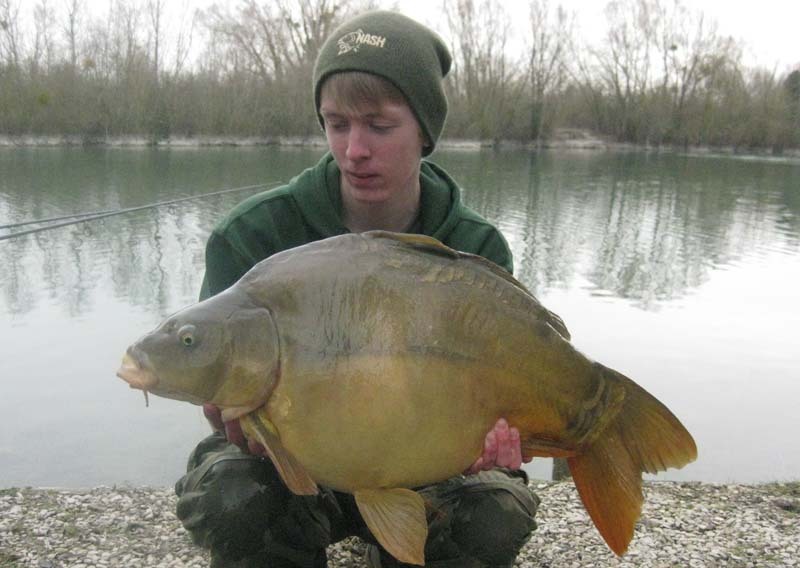 Meanwhile their mate Hans van der Hoeven on peg 3 had the best catch of the week banking 9 carp to 32lb. His main baits were maize, hemp and tiger nuts fished to the far marign and in a clear patch in the weed. After the success of the young lad on peg 3, I decided to give the Croix Blanche lake a go. I chose peg 7 as it gave me access to the bay of peg 1 and the open water where he had caught. I fish three rods in my now familiar set up… snowman, fake maize, but changed the double 12mm pop up to popped up tiger nut, as the Dutch group had caught well on them. Within a couple of hours of casting out my left hand rod had a take. My buzzer didn’t sound for some reason (perhaps a weak battery); but I noticed the hanger stuck in the buzzer and the tip pulling round. I struck and at first thought the fish was snagged up. But steady pressure got it free and after a decent scrap in the margins if rolled into the net. 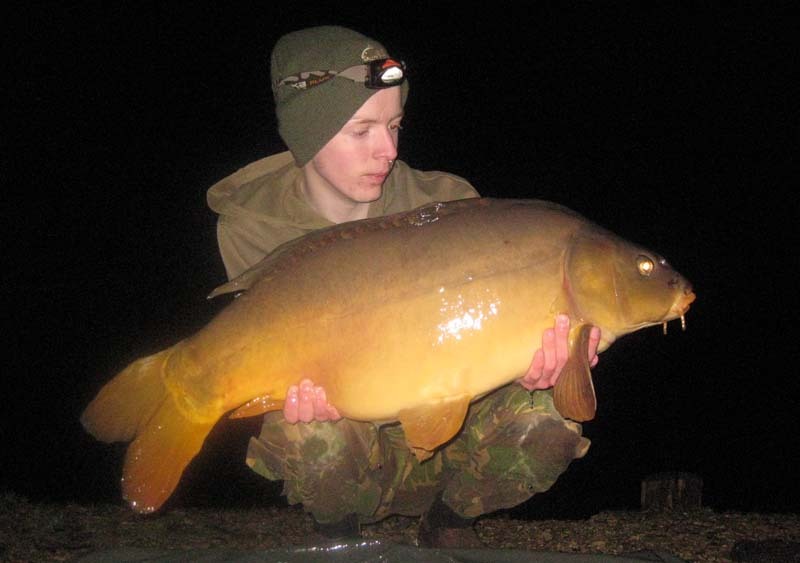 On the scales it went 30lb 8oz, a plump immaculate conditioned mirror. And so the month of March drew to a close. I hope the month of April with the warming temperatures and better weather will see the catches improve. Hi Gareth – what tactics are the cat guys using ?